It really depends on the type and length of session, and how you'd like the images provided. Portrait sessions can vary from $50 to $250. 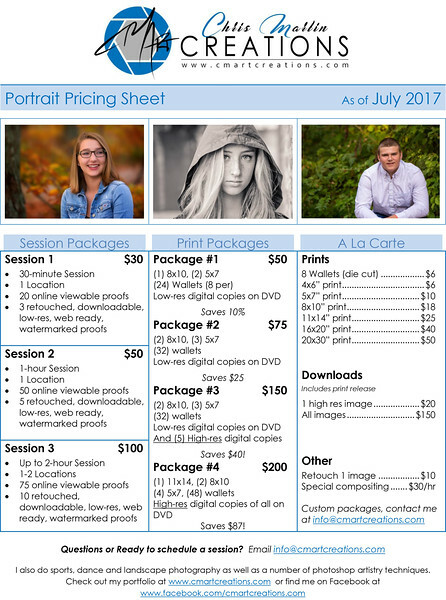 See below for my current 2017 pricelist. Please email info@cmartcreations.com for specific pricing and information about my other services. How does a senior session normally go? We generally agree on what you'd like and then finalize the invoice/contract via email. For the session itself, they are almost always outdoors as I'm primarily a natural light photographer. I get to know the senior and what he/she would like but I'll generally select the shots and poses to get things started. I like to keep it very relaxed and fun and will enlist the help of the parent or friend along the way. After the session, I provide all the proofs within 1-2 weeks from which you can choose your favorite 10 for retouching. Generally 1-2 weeks later you'll have the final product. Do you do more than just senior portraits? Yes. I do sports photography including cheer and dance, team photos and senior banners, corporate headshots, compositing, landscapes. What do you use to edit your images? I use Adobe Lightroom and Photoshop and a few plug-ins. Can I order prints from the SmugMug App? Unfortunately, at this time, SmugMug does not allow ordering from the app. However, you can indeed order from the website either from your phone or a laptop/pc/mac. I'd recommend the latter as it's not easy to navigate all the options viewing the website on your phone. If you just want to view or download the images to your phone, the app is great for that.